la vie DIY: DIY Salsa Jar to French Vase - EASY! 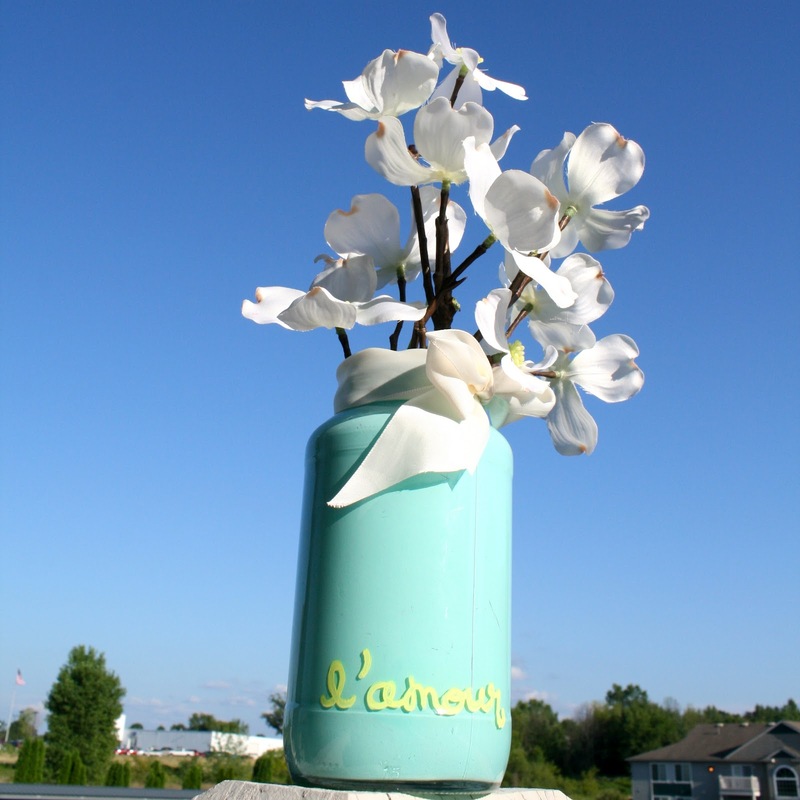 DIY Salsa Jar to French Vase - EASY! Generally I get all of the week's projects done over the weekend, but John was the guest speaker at a camp all weekend (which was awesome- our first camping experience. Incredibly entertaining!) and I went with him. And then yesterday I worked a 16 hour day away from home... sooo... it just wasn't happening. I was working on a project for tomorrow, though, and made this by accident! Ha! SO I thought I'd share it really quickly since it's so easy. You may or may not know that I use empty jam and salsa jars for about everything. They're really handy! One of the most common uses Chez Auna is for mixing paint colors in. I had just mixed up this aqua blue-ish shade in the salsa jar and finished painting tomorrow's project when I was thinking of how pretty the color looked in the glass. I remembered THIS TUTORIAL going around Pinterest from Stylist.com about painting vases and decided to just leave the paint in there! It was so easy. 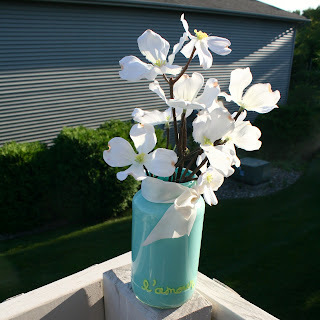 After I painted it, I added a little French byline at the bottom using a craft paint pen. I use those things for all sorts of projects in our home! I recommend keeping a few at your house for painting on glass, china, porcelain, wood... just about anything. And then I tied a little white ribbon at the top just to kind of hide the threading and make it a little more finished. I'd like to go to the store and get a longer ribbon so that the ends cascade down the bottom. Lastly I popped in some white silk flowers I used in making a costume last year. I envision this being full of pink hydrangeas, so I can't wait to go the store and get some! Do me a favor and try to get the mental image, ok? So there you have it! 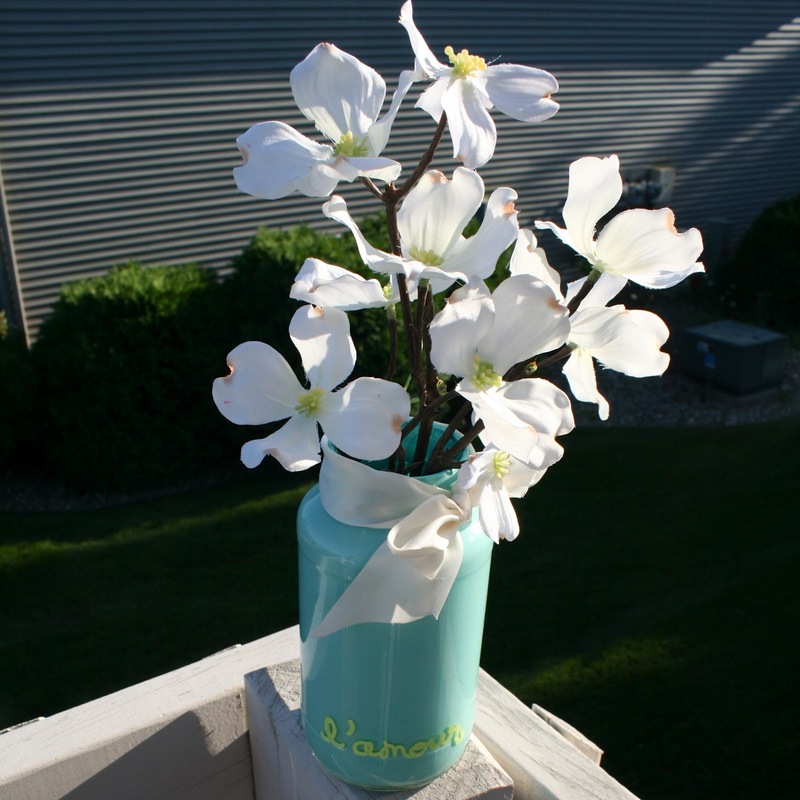 Next time you're painting a little something for home decor, just spread the paint around on the inside and allow it to try, and now you have a matching little vase! I hope your weekend and Monday were fantastic and that the rest of your week shapes up just as nicely. All the best and as always, thanks for reading! ** I just remembered that back in February one of my friends/readers asked for advice about painting a glass vase, so I think original inspiration should go to her! 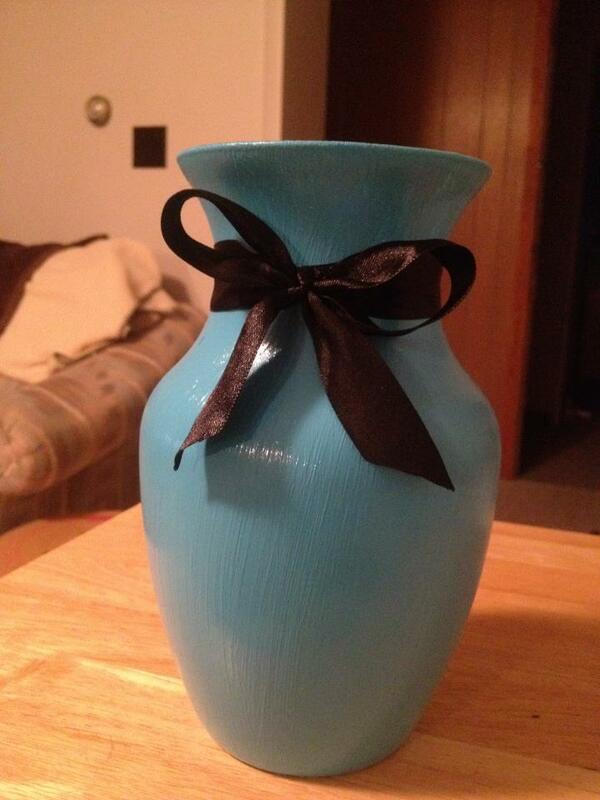 She chose to paint the outside instead of inside, but here is her final product. Way to go, Sam! Cute! 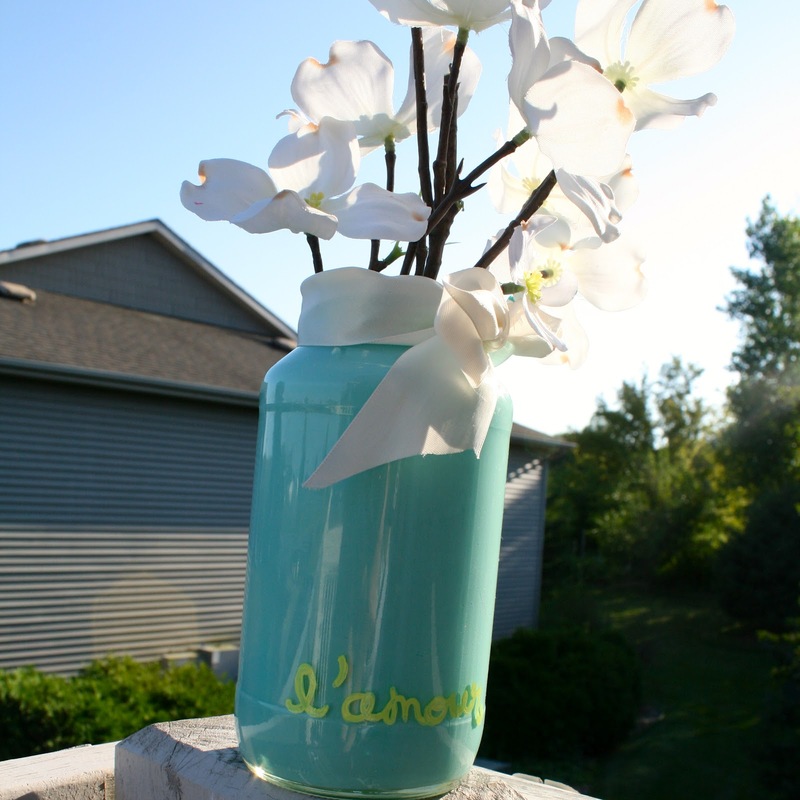 I happen to have an empty jelly jar and craft paint from painting a wood letter for my granddaughter so I'm going to try your idea! Thanks!